Amsterdam Netherland INTERCLEAN exhibition official started on 15th MAY,2018. The Interclean show was held mainly by Amsterdam RAI international exhibition center together with ISSA . 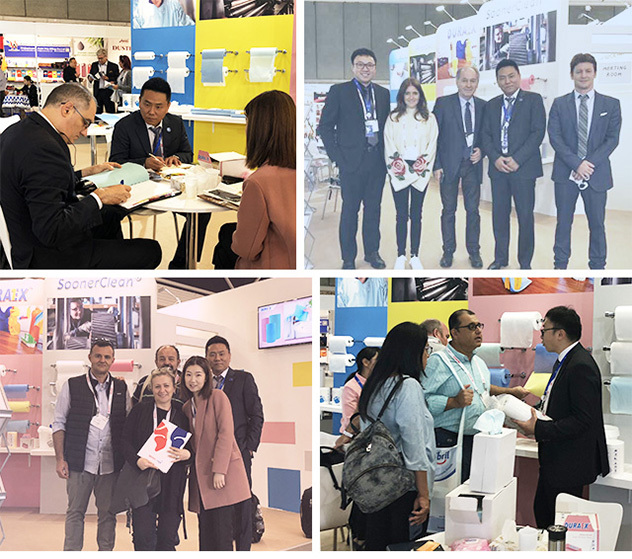 This exhibition has attracted many well-known domestic and foreign companies,together they representing and demonstrating the highest level of products and technologies in the worldwide hygienic area. 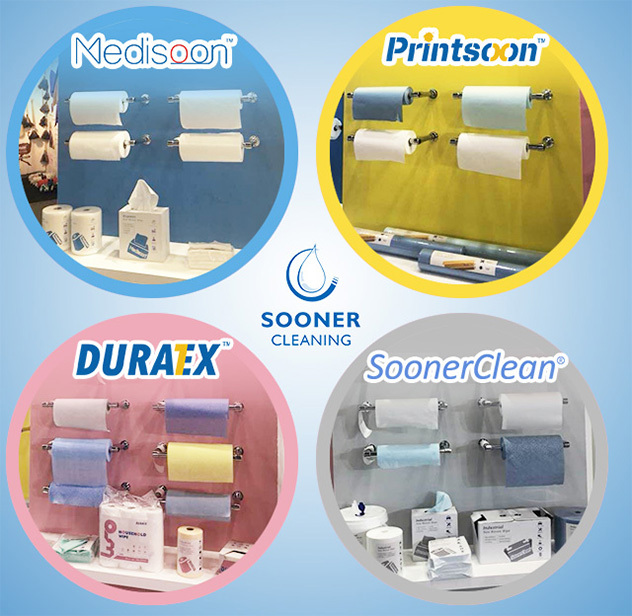 Beijing Soonercleaning Technology Co.,Ltd has fully displayed the products of their 4 flagship brands :SoonerClean® (Industrial cleaning), Duratex® (Household cleaning), Medisoon® (Medical products), Printsoon® (Printing cleaning). --SoonerClean®(Industrial cleaning)：Application area: Automotive Industry,Laboratory Instrument,Electronics Cleaning,Production Line Maintenance, Heavy Oil Remove,Metal Shavings. Product features:High Absorbency,Soft Hand Feeling,Low linting,Durability and Abrasive Resistant,Eco-friendly,Solvent-Resistant. --Duratex®(Household cleaning)：Application area: Foodservice,Restaurant Cleaning,Household Cleaning,Hotel Cleaning,Dish Washing,Floor Wiping,Kitchen Cleaning,Restaurant Tablecloth. Products feature:High Absorbency, Soft Hand Feeling, Low Linting,Durability,Reusable, Economical and Eco-friendly, Easy to Reserve,Safe in Use. --Medisoon®(Medical products)：Application area: Medical Hand Cleaning, Patient Care ,All-purpose Cleaning, Surgical Gown Manufacturing. Products feature:Soft Hand Feeling,Hygiene,Disposable, High Absorbency,Low Linting. --Printsoon®(Printing cleaning)：Application area: Printing Press Roller Cleaning,Printing Press Maintenance,Printing Ink Cleaning. Products feature:Excelent Absorbency,Extremely High Longitudinal Strength,Solvent-Resistant ,Low Linting,Uniformly of Thickness(Equithickness). 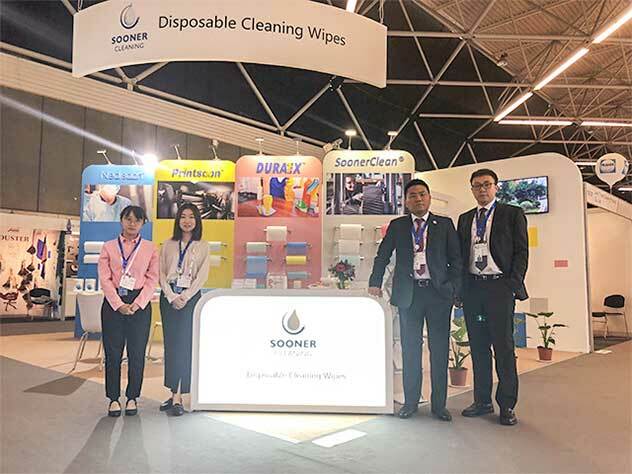 The main purpose of Soonercleaning’s participation in this exhibition is to broaden its horizons, enlighten the ideas, quest for communication and cooperation, and make full use of this exhibition opportunity to communicate and negotiate with customers who come to visit, to perfectly demonstrate the company’s product advantages and further enhance our brand’s Popularity and influence. Wishing the exhibition a complete success! 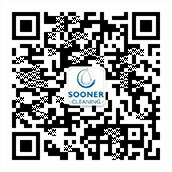 We will also continue to work hard to get Soonercleaning been known by more people.